16 pages including cover and back summary. 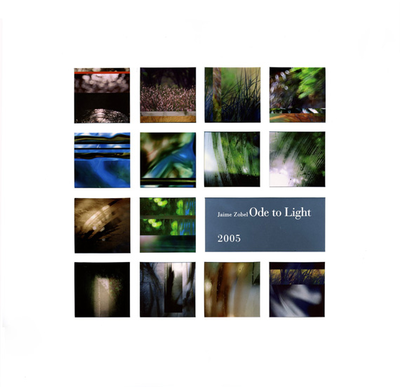 Size: 14" x 14"
"Ode to Light is a celebration of light as both medium and subject. In the series, Zobel "paints" with light. Using the collage techniques he has come to master, he brings together fragments drawn from various photographs of nature that he has taken. The fragments bring to light the textures of wood, or sand, or grass in photographic abstractions that reveal once again Zobel's deep love for natural simplicity."